Manchester City travel to Schalke in the Champions League on Wednesday looking to keep their hopes of competing on four fronts alive. Pep Guardiola's outfit are top of the Premier League, take on Chelsea in the Carabao Cup final on Sunday and are into the FA Cup quarter-finals. Now they face the first leg of their last-16 tie at the Veltins-Arena, with kick-off 20:00 GMT. Here are four things to keep an eye on heading into the match. A coach following in Klopp's footsteps? Schalke sporting director Christian Heidel has a knack for unearthing young coaches, and he seems to have found another gem in Domenico Tedesco. Heidel is the man who handed first-team coaching opportunities to Jurgen Klopp and Thomas Tuchel during his time at Mainz, with both protegees also managing in this season's Champions League knockout stages - with Liverpool and Paris St-Germain respectively. Italy-born Tedesco, who at 33 is younger than Manchester City midfielder Fernandinho, was picked by Heidel after a three-month stint at second-tier Erzgebirge Aue during which he saved the club from relegation in his first senior coaching role. 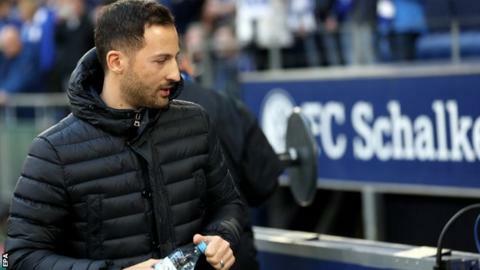 Former Stuttgart and Hoffenheim academy coach Tedesco took over at Schalke at the beginning of last season and guided them to a second-place finish. But there is more to Tedesco than just football - the business engineering graduate, who also has a masters degree in innovation management, used to work for Mercedes and is fluent in five languages. He never played professional football, but will get to test himself against one of the world's best coaches in Guardiola. The trip to Schalke should bring back memories for Leroy Sane, who graduated from the German side's youth academy. But it was not always guaranteed that Sane would make the grade, with the winger taking time to emerge as one of the star players in his age group. "When he was 15 I'd heard of him but I didn't really pay much attention to him because in his first two years at Schalke he didn't play much," explained Der Westen journalist David Herten. "He sat on the bench most games and he wasn't regarded as one of the most talented prospects at his age. When he turned 17 he had this amazing rise. He suddenly became the star for Schalke at the under-19s." Sane, now 23, was offered a professional contract at 18 and made his debut a month later. The following season he shot to the world's attention with an impressive display in the Champions League last-16 second leg against Real Madrid, despite Schalke losing 5-4 on aggregate. "He scored a beautiful goal, had one assist," added Herten. "Suddenly everybody in Germany knew who Leroy Sane was. "After that he got his first nomination for the German national team. People realised how talented this kid is." Manchester City should know one player in the Schalke ranks more than most - Wales winger Rabbi Matondo. The 18-year-old joined the German outfit for £9.6m in January having never played a senior game for City, despite making his international debut for Wales in November. Matondo, who was credited as being the fastest player on City's books during speed tests last year, made his first Bundesliga start in a 0-0 draw with Freiburg on Saturday. That made him the first Wales international to start a German top-flight match since since May 1988, when former forward Mark Hughes was sent off for Bayern in a 2-1 win over Stuttgart. Schalke head coach Tedesco said in January: "We are impressed with his potential. He is extremely quick and technically strong. "We can't forget how young he is, though. We will give him the time he needs to find his feet at Schalke and in the Bundesliga." Another player who could line up against his former club is Matija Nastasic, the 25-year-old Serbia centre-back who left City for the Bundesliga side in 2015. Tedesco may have led Schalke to Champions League football in his first season at the helm but his side have struggled to recreate that form this term. The Royal Blues have won only once in the league since the turn of the year and are closer to the relegation zone than European qualification. The goalless draw against Freiburg followed defeats by Bayern Munich and Borussia Monchengladbach, increasing Schalke's run without a win to four Bundesliga matches. But Saturday's stalemate was notable because Tedesco name Schalke's youngest starting XI since December 2016, with Matondo's full debut helping bring the average age down to 24.5 years. The highly rated and versatile 20-year-old USA international Weston McKennie was named at right-back, and 18-year-old Turkish forward Ahmed Kutucu and 20-year-old Germany Under-21 midfielder Suat Serdar, who was sent off, also started. Schalke have saved their best form for the Champions League this season, losing only once in a group containing Porto, Galatasaray and Lokomotiv Moscow to progress in second place.